This month I decided to do something a little different with my marathon... while working on seeing some more of the classic films. I am taking a list of well known actresses from the past and each day that I can watch at least 1 movie I will draw a name by random and watch at least 1 film from my collection with her in it. Here is my current list of actresses for the marathon. If I am missing a well known actress from the past (lets say from the '30s to the '50s) let me know who and I will see if I have anything in my collection with her to add it to my marathon. So am I missing anyone important? Also, anyone now a program (preferably free) that I can put a list of names in that will randomly pick a name for you? Maybe Lana Turner. Veronica Lake. I've always had a soft spot for Jean Arthur. Lana Turner I have 1 title for. I have 1 title for Jean Arthur as well. Just tested it out a bit. A little different then I imagined... but will definitely do the trick. Thanks again! With the help from some at another forum... I updated the list some. The unfortunate thing for this one is I only have the one title for her. Though this could be a good thing as I do have to work today and my not have time for more. If by chance I do... I guess I would just have to do a second drawing for today? Sorry... never thought this through completely yet I guess. Well... hard choice here... guess what I will be watching! Dashing Errol Flynn triumphs in this lavish, fast-paced version of the Robin Hood legend, a winner of three Academy Awards®** in ravishing Technicolor®. Doing many stunts himself, Flynn is at his athletic, romantic best in a role originally intended for James Cagney. Olivia de Havilland (as Maid Marian), consummate screen villains Basil Rathbone and Claude Rains and a boisterous who's who of character actors co-star. Welcome to Sherwood! ** 1938: Best Film Editing, Interior Decoration and Original Score (Erich Wolfgang Korngold). This is the first time I ever seen this one. And I must say I enjoyed it very much! I loved the story line... which I knew I would as I have of course seen other versions. 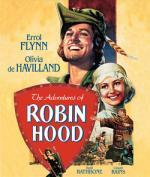 Errol Flynn was great as Robin Hood... as was Olivia de Havilland as Maid Marian. I also liked the sense of humor used for a few of the characters in this film. Most noted Robin Hood himself. Being a film from 1938 I was surprised to see this film be in color. I am guessing this was the reason for the one thing I did find a little overdone. The color and fanciness of a lot of the costumes. Over all a great movie I can recommend with ease. OK... at least I have a few of her movies to choose from. And I am off today so hopefully will have time for more then one today! In the role of bookstore clerk transformed into a modeling sensation, Hepburn showcases singing and dancing skills she had honed on the London stage, performing "How Long Has This Been Going On?," a "Basal Metabolism" dance in a cool-cat bistro and more. Astaire, as the fashion photographer who discovers her, conjures up his inimitable magic for sequences that include his "Let's Kiss And Make Up" matador diversion, a heavenly dance with Hepburn to "He Loves And She Loves" and, again with Hepburn, the title-tune enchantment, "I Love Your Funny Face." Now and forever, so do we. Going by the trailer I thought I would like this one more then I did. It is not a bad movie by any means. 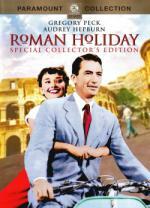 But I just couldn't get past not liking Audrey Hepburn's character in this one. And it really brought the enjoyment of the film down for me. I still found the movie worth the time put in to watch it... but it will not become one of my favorites. This one I really enjoyed. I liked all the characters and it has a good story. I definitely felt Hepburn did a wonderful job in this one. I couldn't imagine the role being done any better. Peck was also good here. I knew the character would do what was right in the end... so I can't say it wasn't predictable. But even being predictable the story keeps you invested through-out with ease. This one is definitely worth the time put in to watch it. I am off today so hoping to watch a couple anyway.